"This is a family favorite sugar cookie recipe handed down to me from my mom. When my husband was deployed to Iraq, he was always excited to receive a box of these in the mail. I always make sure to watch these closely and take them out of the oven before they brown. If they brown, they will end up too hard and crunchy." Beat 2 cups sugar, butter, and vegetable oil with an electric mixer in a large bowl until smooth. Add egg yolks one at a time, allowing each egg to blend into the butter mixture before adding the next. Sift flour, baking soda, cream of tartar, and salt into the egg yolk mixture; stir. Stir in vanilla extract. Roll the dough into walnut-sized balls. Spread 1/4 cup sugar onto a flat surface. Roll the balls of dough in sugar to coat. Arrange onto baking sheets spaced at least 2 inches apart. Bake in preheated oven cooked in the middle, but not yet browned, about 15 minutes. Great comfort cookie...especially tasty while still warm! These are absolutely delicious!!! I am not a cookie girl, but these are a major temptation! Thanks for a great recipe! 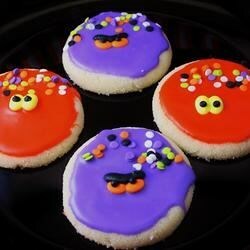 Best best best sugar cookie! I am eating them all please stop me:) Perfection. These turned out great! Chewy and sweet enough they don't need icing if you don't want to. I added more vanilla than the recipe called for and will definitely make again.